Hi there! How are you? I hope everyone had a wonderful Pentecost and Memorial Day. We had an amazing weekend that was filled with so many special moments not even a deluge of rain could dampen our spirits. I will be blogging about all of our fun over this next week, but I wanted to begin with the most memorable one. 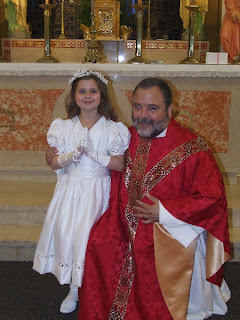 Sunshine received her First Holy Communion this past Sunday. She was beaming! She had been very nervous a few weeks ago due to a notion she had that she would have to stand up and answer questions in front of everybody (like St. Bernadette in the movie). She calmed down quite a bit when she realized all she had to say was "Amen". Father usually likes the parents to kneel on either side of the First Communicant, but Shortcake asked if she could be next to her sister. Never having had a sister myself, I couldn't refuse this sweet display of filial affection. I was on her other side just watching with amazement. The tears snuck in when we were back in the pew and I saw the smile on her face. She was radiant! 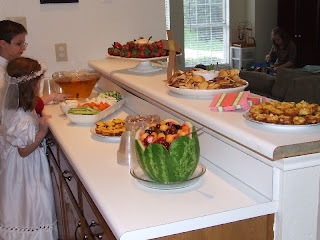 The menu consisted of mini-Denver Omelet quiche, smoked salmon spread with bagel chips, veggies, strawberries with cappuccino mousse and white grape cooler punch. Fruit cocktail was a special request of Sunshine's. I highly recommend the Cappuccino Mousse recipe. It was very easy and tasted delicious! We had a wonderful afternoon celebrating with family and friends. A flooding barn, a master's thesis and a beautiful new baby decreased our numbers by about 6 (good excuses all!) Thank you to all who came to help us commemorate this special day. UPDATED to include the recipe for Cappuccino Mousse. 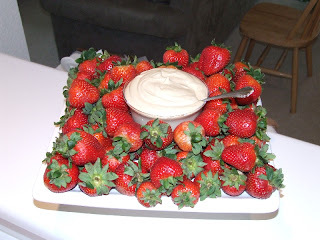 This is the original recipe although I have used white chocolate pudding instead of vanilla and it tasted great! Also below is the recipe for Denver Omelet Quiche. I baked mine in muffin tins to make them "mini". Mix all ingredients together and bake with or without crust at 350 degrees until done. Approx. 25-30 minutes (less time required for muffin tins). Let stand 5-10 minutes before serving. Can you post the cappuccino mousse recipe? What a fabulous day!Congrats to your little ray of sunshine! What a beautiful young lady she is! Congratulations to all of you on such a special day! Congratulations, Sunshine! You looked so lovely, and I bet you had a lot of fun! What a special day! This is Madeleine in Washington. 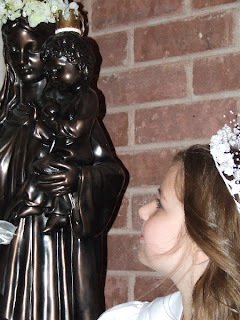 Congratulations on your First Holy Communion. When your mom said that about the Bernadette movie, I laughed because I remembered that part. Your priest looks very nice. I am Dorothy Jo. 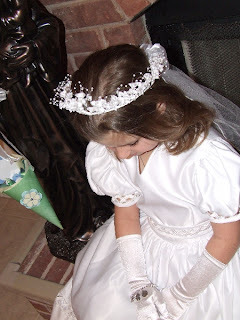 Happy First Communion. I like your strawberries. Your cake looks yummy. Your dress is very pretty. Bye. Congratulations on receiving Jesus for the First Time! I'm sure it was a very special day for you and your whole family. My daughters loved seeing pictures of you! They were very excited! What a glorious day you have caught so well on camera. 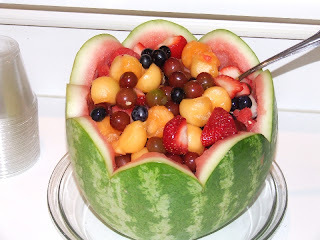 On the food table, I particularly love your fruit bowl - what a great idea! I loved your line, where your daughter had only to say, "Amen" it had me giggling! 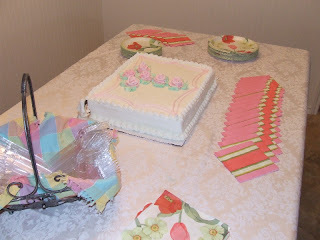 Congratulations on your daughter, congratulations on your wonderful celebration for her! I linked to the Cappuccino Mousse and posted the Denver Omelet Quiche.